4/2 CEM wins Peabody Award! We're so proud and pleased and overwhelmed to announce that this morning the Center for Emerging Media was honored with a 2007 Peabody Award for the series Just Words. Just Words was a weekly documentary feature series that gave voice to marginalized people-low wage workers, ex felons, recovering addicts, the homeless, and more. You can listen to it here. We share the honor this year with some of our colleagues in public radio such as Speaking of Faith, the Brian Lehrer Show, and Wait, Wait...Don't Tell Me! Also honored were television programs such as The Colbert Report and the BBC/Discovery Channel series Planet Earth. A full list of 2007 winners can be found here. All the winners ever are listed here. Thanks for all your support! We couldn't do without it. We’re so proud and pleased and overwhelmed to announce that this morning the Center for Emerging Media was honored with a 2007 Peabody Award for the series Just Words. Just Words was a weekly documentary feature series that gave voice to marginalized people-low wage workers, ex felons, recovering addicts, the homeless, and more. You can listen to it here. We share the honor this year with some of our colleagues in public radio such as Speaking of Faith, the Brian Lehrer Show, and Wait, Wait…Don’t Tell Me! Also honored were television programs such as The Colbert Report and the BBC/Discovery Channel series Planet Earth. A full list of 2007 winners can be found here. All the winners ever are listed here. Thanks for all your support! We couldn’t do without it. Congratulations to Marc and Jessica. You earned it. You’re doing great work and service to the community. Now, how did Marc’s mug get on the award? I hope you guys feel vindicated, because I certainly do. I can’t stop grinning – congrats on this well deserved honor! I am so thrilled to hear this. You guys really deserve it. I hope this will lead to more CEM programs both online and through broadcasts around the country. I really appreciate the serious journalism that you are doing. Hey All – Congrats, this is very, very well deserved! On a vaguely related note, I’ve noticed that when I stream this and other (always wonderful) pieces from the CEM site, the file sounds like a record played at too slow a speed; ie Marc’s voice sounds a lot lower than usual. If other folks are having this trouble, maybe it’s a mismatch somewhere between 44.1 and 48kHz sampling frequencies? Of course It is also a nice little slap in the face a Brandon and his cohorts…. an added little bonus !!! Wonderful, well deserved recognition to Marc and Jessica for their great series. Maria Allwine was cut off by the WYPR censors today when she tried to announce this on air. The CAB meeting last nite was another strong step towards the restoration of the “Public” into our public radio. This is the BEST news!! Not that you needed it, but what sweet vindication. Congratulations to Marc and Jessica for a wonderful program that I miss so much. I used to wait to get out of bed that one morning every week until Just Words was over – I didn’t want to miss it. Kind of like going to my car every day at lunch to listen to The Steiner Show. Hats off to the buffoons at WYPR for firing a nationally recognized journalist. It will be years before they live this down. What smart businessperson would fire a Peabody Award winner? That would be our very own WYPR, now looking for our financial support. What a mess they’ve made. They couldn’t run a lemonade stand, much less a public radio station. I am so happy for you, Marc and Jessica and so proud of your work. Congratulations!! The award is well deserved! Can this award and the WYPR backstory be leveraged into an appearance on E! or a segment on Keith Olbermann’s program? Perhaps a sit-down with David Letterman? 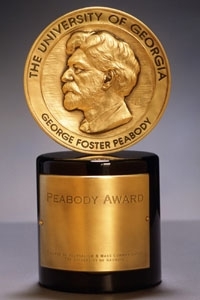 I’ve never seen a Peabody Awards show, and Google isn’t showing me any video of a complete show from the past. Do all winners get to appear at the podium? If yes, great. If no, I hope something about this story helps CEM make it on-screen. Hey, Jessica, how does a 25-year-old feel when she wins a Peabody? Since his firing, Steiner has been blogging and working on projects with his production company, Center for Emerging Media. He said he would return to WYPR if he could. Far as I know, Marc has not said this publicly until now. I don’t know if he has said it to anyone privately, or course. In any case, Steiner and Brandon may have a “him or me but not both of us” problem. Of the two, Steiner seems more like an adult. Someone at WYPR should interview Steiner and/or Phillips about this huge win, don’t you think? Lots of places to put the interview, and not doing it would be an incredible gaffe, seems to me. And Jill Rosen wrote a good article on this in today’s (4/3) Sun. Ahhhh it’s so sweet! a Peabody. No one could deserve it more. Congrats Marc & Jessica! How sweet it is! Congrats Marc & Jessica. I’ve been listening on and off to the pledge drive on WYPR. Tony Brandon asserted in the Sun today that we weren’t having an affect on the pledge drive and things were going along as usual. However, I’ve noticed that the announcers are not giving hourly pledge targets as they always have before, nor are there updates on how much they have received in a given time period. I haven’t been listening 24/7, so perhaps I’ve missed something, but has anyone else had this impression? BTW, great job getting in your comment on Midday, Maria! Absolute congratulations man. I’ve been listeinging to those pieces and hanging out in front of 2216 Charles at times. The pieces are the finest journalism and finest radio I’ve heard. I have one question. Are you sure this whole scenario isn’t the documentary version of a season on The Wire? Congratulations to Marc & Jessica! What wonderful recognition that is well deserved. Looking forward to your future productions as well. Congratulations, Marc and Jessica! You deserve the acknowledgment and recognition. I loved the series and hearing voices of those who generally have no voice! You did a great job! I was pleased to see the article in The Sun, too. Amazing news. Congratulations, I’m very proud of all of you. Steiner said he would be willing to return if asked by WYPR. “I love what I do,” he said. The article is linked in the “Press” section of this blog, and I am at fault for not having read it until now. I apologize for posting the misinformation that Marc had not said this before the recent Jill Rosen article. Please, people, correct me when I’m wrong. Congratulations to Marc & Jessica!The award is well deserved!